Are you looking for fresh ideas to engage the next generation of audiences, build sustainable partnerships that generate ticket sales, and expand your ability to inspire creativity in your local community? Social Media can no longer be ignored as an essential piece of the puzzle for every arts presenter to build a sustainable and thriving future in the performing arts. These nine strategies are geared for all presenters, whether you have a dedicated marketing staff or if you play many roles in a small organization. Effective use of social media is more than a set of web sites and tools; it requires a fundamental mindset and understanding of where these tools fit into your existing workflow and strategy as a presenter. Social media will play a key role in your audience development efforts, artistic engagement, youth education, fundraising, and your mission to make an impact through the arts. 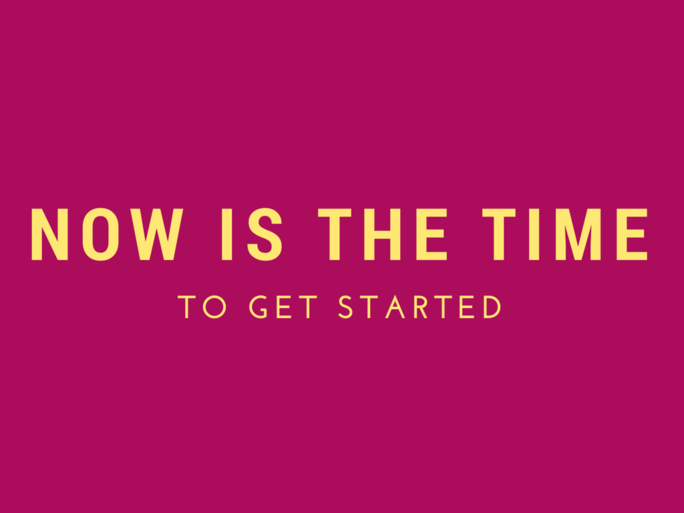 If social media is not an integrated part of your presenting strategy, now is the time to start. 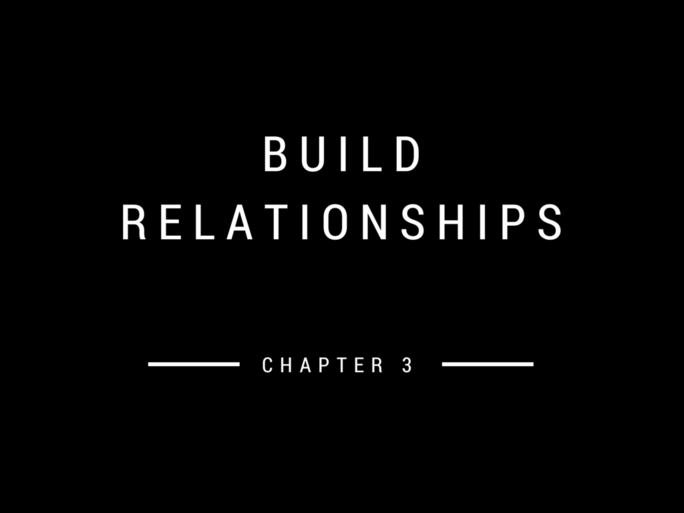 The future of your organization depends on strong connections and partnerships with audiences that increasingly communicate and interact online. 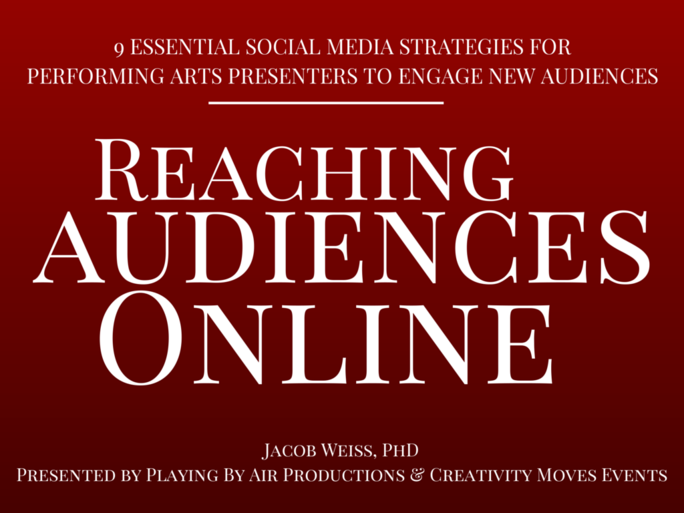 Jacob Weiss, PhD, is the director of Playing By Air Productions, a touring theatrical show that bridges comedy, juggling, and music with innovative community engagement. Dr. Weiss' doctoral research focused on building online partnerships for middle Tennessee cancer survivorship programs, and his post-doctoral work applied these community-building strategies to the Creative Campus initiative at Vanderbilt University. As a presenter, you are responsible to bring your performances to your community with high artistic quality that also are marketable to your audiences. 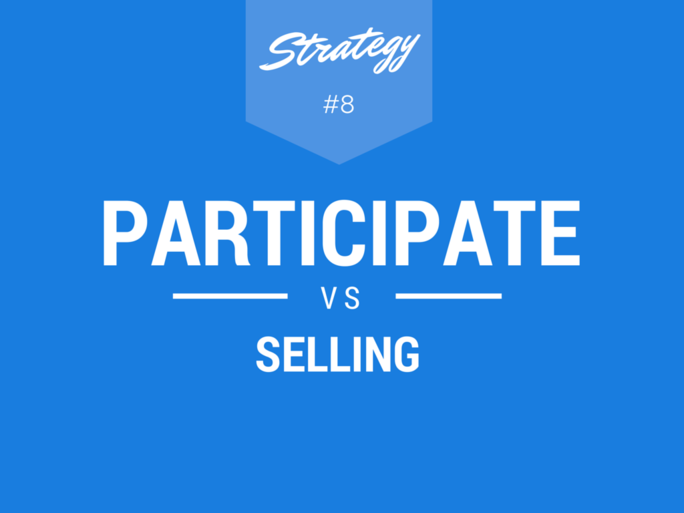 These two parallel goals must work together to effectively attract and engage an audience. With this goal in mind, social media can be integrated into elements of the artistic production, enhancing both the art and the marketing. In the 21st Century, social media, program curation, and arts education are not isolated entities. Together, they weave into an opportunity to impact your community greater than each individual component. The following three strategies use social media to give your audience new opportunities to engage with the creative process. These approaches give touring artists, production crew, and volunteers a way to tell their stories through social media, which will in turn attract more deeply invested audiences. Give your audience an opportunity to share their excitement, emotions, and ideas sparked by the performances on stage. Many of your audience members’ media of choice for self-expression is sharing on Facebook, Twitter, Pinterest, Instagram, SnapChat, Vine, and YouTube. Your challenge as a presenter is to balance a respect for the artists and live theatrical performance while embracing these new forms of self-expression and community building. Designate select seats as "Tweet Seats" and encourage these ticket holders or volunteers to share their responses during and/or after the performance. Provide a #hashtag to keep these Tweets organized and accessible over the course of your season. The goal of this approach is to provide a deeper artistic engagement for attendees, as well as engage their online followers with a trusted recommendation for the performance. 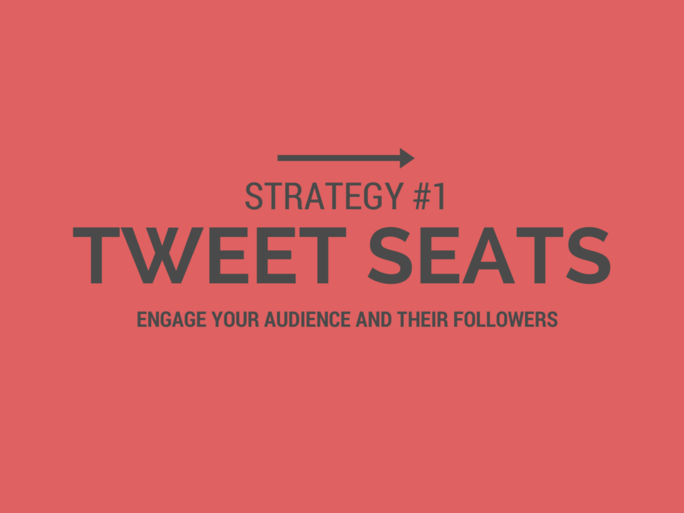 Bonus Tip: Invite community influencers with large online followings to participate in your Tweet Seat program, in addition to general audience members through online ticket giveaways, to maximize your reach. Residencies and workshops led by touring artists are a powerful way to invite your community to experience and actively engage in the creative process. Several touring productions allow local workshop participants to perform alongside the artists on stage as part of the live production. But what about shows that do not lend themselves to on stage participation? Social media offers a performance outlet for participants to showcase their newly developed talents with wide networks of their family, friends, and supporters. 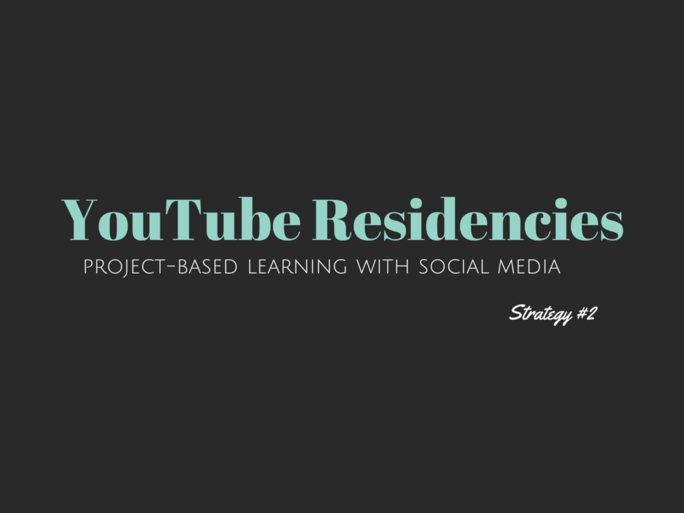 Programs such as Playing By Air's "YouTube Residencies" feature workshops that include an online video collaboration between the presentation organization, the touring artists, the participants, and the local city. Participants get to keep a tangible memory of their experience as well as learn new elements of the creative process required for online platforms. The artist and presenter gain visibility through the online sharing by the participants, by local media, and through the potential of a viral video. 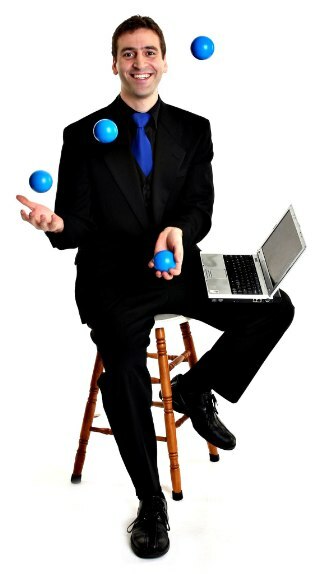 Juggling 50 exercise balls at once for cancer awareness! In addition to the deep engagement of hands-on workshops, social media offers opportunities to invite wider audiences into the creative process of your productions. Look for key times to share "behind the scenes" stories from both the touring artists and your own production team. Explore using a combination of text, photos, and videos. Social media posts can range from a simple backstage photo to more in-depth artist interviews, along with your own creative ideas! A video or text interview with the touring artists (with questions about their creative process submitted by fans online). Think of it as your own “Ask Me Anything” section of your online presence (see the popular reddit AMA for inspiration). A photo montage that shows the process of turning a blank stage into large-scale set. A video message to your community by the touring artists from the road, to promote the show. Photos of visually interesting props, costumes, or set designs. 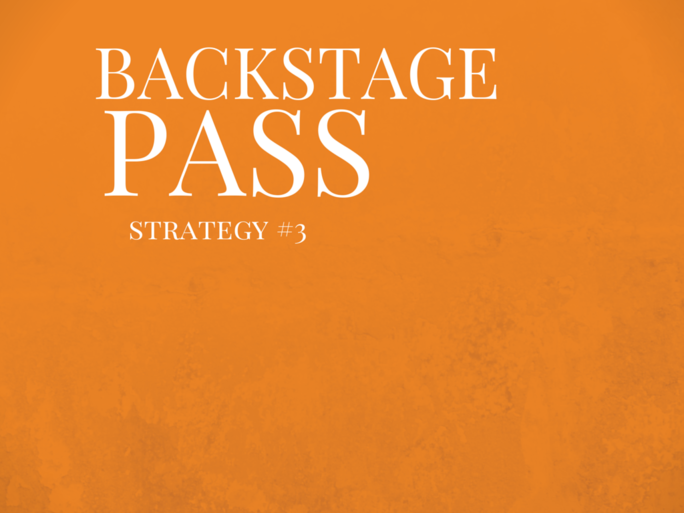 Encourage your production team and volunteers to contribute ideas of where the most interesting "backstage" stories can be captured. Audiences will connect on a deeper level with the touring artists as well as your own organization when you open up and share personal stories. From YouTube videos to behind-the-scenes photos, engaging content is most effective when you have an active network of advocates, peers, and audiences who want to engage with you online. As you are building your social media presence, how do you begin to find and connect with your target audiences and partners? The key to finding your audience online is not to get so focused on sharing your own content that you forget to listen to your community and participate in conversations that are already happening online. Even before you have an extensive stream of quality content to share, developing key social media listening skills will build the foundation on which your future online presence will thrive. Do you know who in your local community is passionate about dance? How do you find local dance programs and students who would jump at the chance to take a masterclass with the professional dancers from your next production? Twitter is an excellent resource to find people and organizations passionate about specific topics of interest throughout your presenting season. Try this: When you are presenting an innovative modern dance company, search on Twitter for the keyword "dance" along with your local city or university's name (or geocode location). Did you find someone new to follow on Twitter or a potential partner to contact by email or phone? 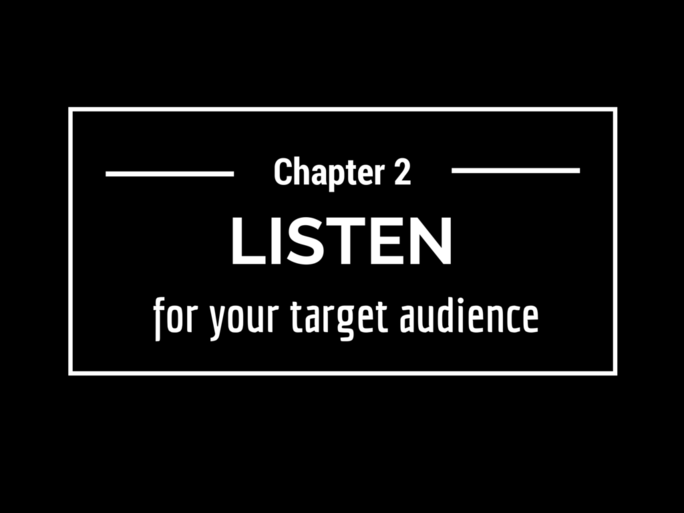 A keyword-based approach to listening is iterative. 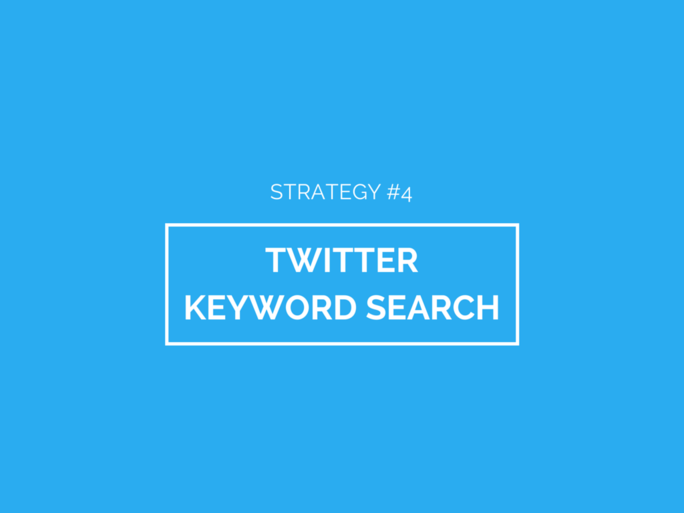 Looking for other keywords can uncover more conversations. Experiment with searches that include the names of other local universities, schools, or towns. How about related phrases used by people who are interested in modern dance, such as "rehearsal," “aerial,” "gymnastics," or "yoga"? Is your team seeking partners to support an autism-friendly family performance? Search Twitter for keywords used by the autism community as a starting point to discover and invite local advocates and families. It is important to remember that a keyword-based approach to listening will not replace all other forms of listening and networking in your community. This strategy is one part of the puzzle to ensure that you are not missing out on a key fan or community partner who will be passionate about supporting your current and future programs. Listening through keywords can help you find everyday audience members as well as the passionate leaders of your local community. As you begin to find and follow conversations online, pay attention to individuals and groups with strong followings and fan bases. 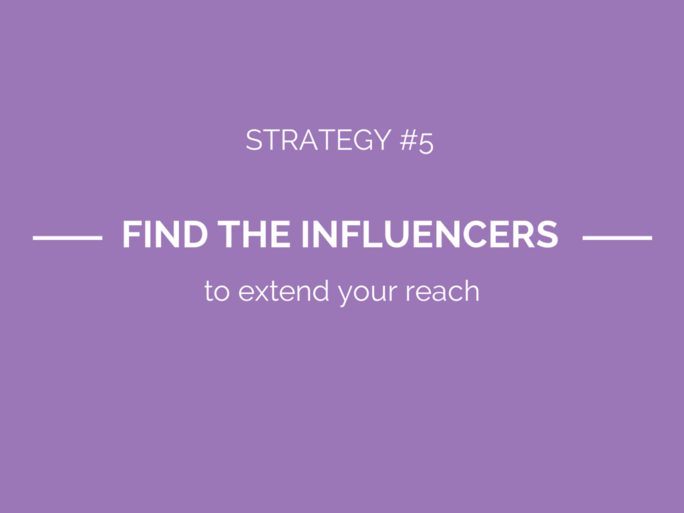 These online influencers can expand your reach and visibility by sharing your content, or by engaging in a public conversation thread with you. Do you know who the online, and offline, influencers are in your local community? As you develop your social media platforms, devote time to engage the individuals who will be powerful advocates for your mission as an organization and who have the ability to greatly multiply the reach of your online network. Now that you are discovering a wide array of online fans, partners, and influencers around a variety of topics, how do you keep all of these people organized without overwhelming you and your social media team? Facebook, Twitter, and LinkedIn each allow you to create private, personal lists to segment your friends and followers. 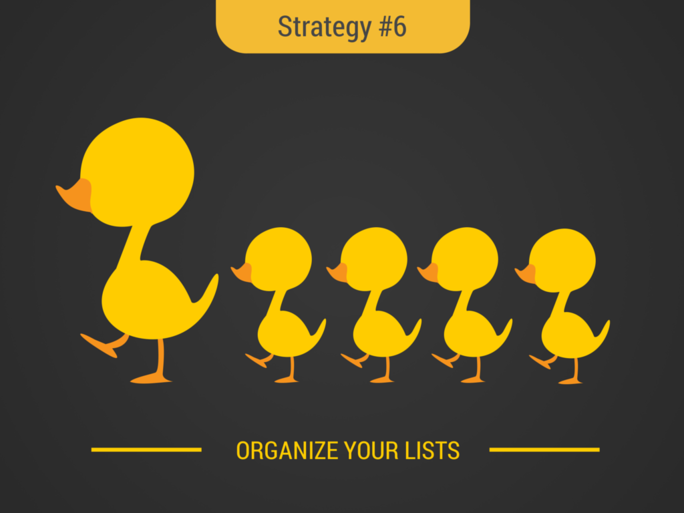 Don't underestimate the value of adding contacts to segmented lists while you are building your network. As your network grows, these lists will help you listen with a targeted purpose, filtering through the noise to engage with conversations that you don't want to miss. Create a list of the key influencers from your overall network of connections. You can also create lists for different audience segments organized by artistic interest or demographic. The lists that you curate as part of your social media engagement efforts will be helpful for many members of your team, from marketing research to curating future programs. In order to most effectively activate your network, build and nurture these lists before you have a reason to engage with them for a specific production or program. These social media listening strategies are especially powerful for presenters who need to build audiences and partnerships in their local geographic community. As described previously (in Strategy 4), the use of city names or geocodes combined with targeted keywords is a powerful technique to discover local audiences and influencers. Keep in mind that social media is not only a way to share your content with fans around the world; these networks also can help you build strong relationships with real people in your local region. These are people who can attend performances, participate in workshops, purchase group tickets, and become your next big donor or sponsor. 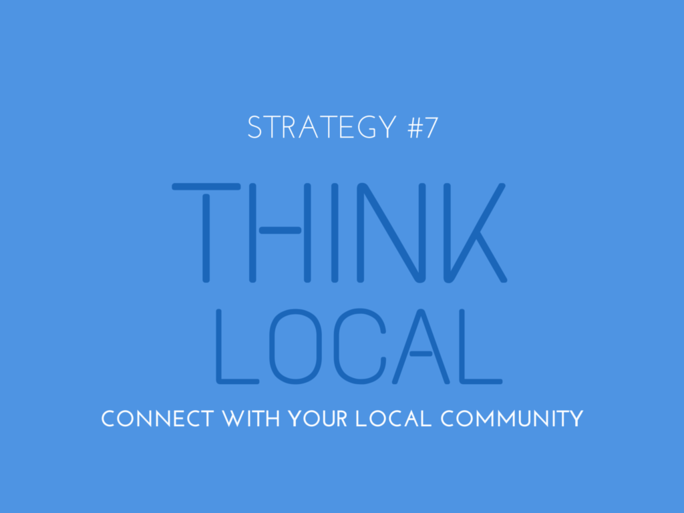 Thinking local is a mindset that will shape your overall social media strategy, especially in how you blend social media with real-world audience engagement strategies. 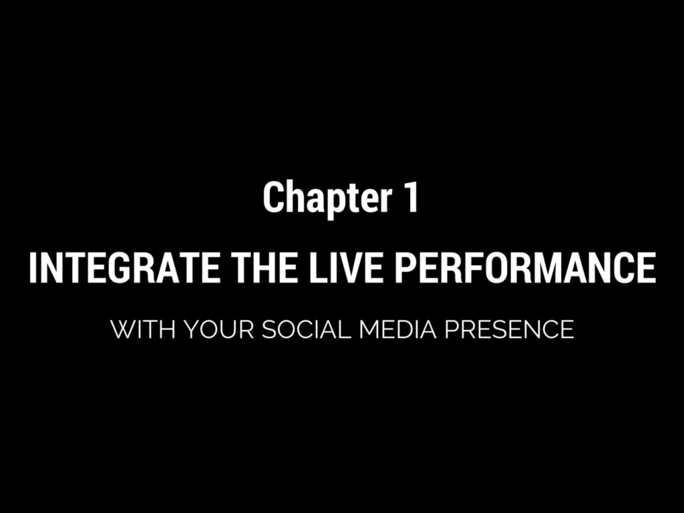 Just as social media can integrate with live performances and workshops, your online strategies should align with your organization's broader marketing and engagement goals. Try this: Before and after you meet with a new local partner or donor in person, follow them on social media, listen to what they talk about, and look for opportunities to support them in ways that they find meaningful. To fully harness the value of listening on social media, you must also participate in conversations with your network. By actively listening and participating, you can develop mutually supportive relationships by adding value to your network. This service-driven mindset is not unlike your overall mission as a performing arts presenter in your community. You exist to make an impact, not merely to sell tickets to shows. When your social media strategy focuses on this mission and mindset, rather than counting likes and followers, you will have the opportunity to nurture a network of powerful advocates for your organization. It is easy to get caught up in using social media to promote ticket sales, special deals, and announcements for your performing arts series. While these announcements should indeed be part of your overall content, they should not be the primary focus for your social media channels. Use your social media platform to support, retweet, and celebrate your partners in the community. Tag and thank supporters and participants who are in the photos that you share. Create, curate, and share insightful stories that spark conversation, ideas, and inspire your followers. Be a resource for creativity and the arts, and contribute to other conversations with a valuable perspective that you can bring to the table. This mindset of participation and contribution changes the tone of the interactions with your online network from "Buy tickets now!" to "Let's join together on a mission that we are both passionate about supporting." Which style do you think is a more powerful strategy for ongoing sales, sponsorships, and community relationships? 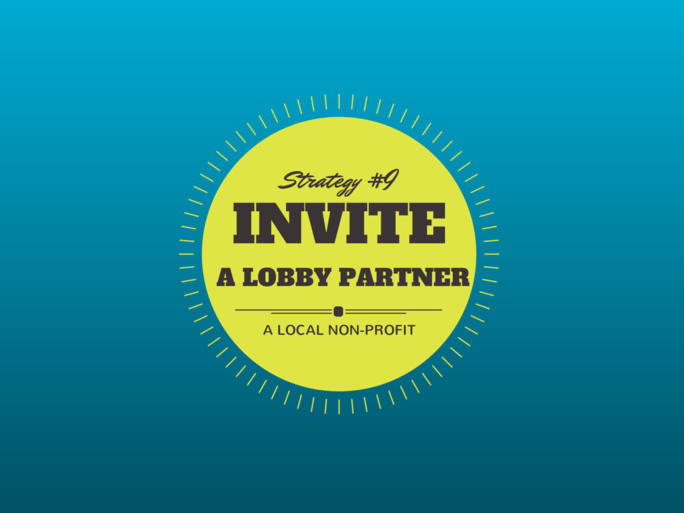 Inviting a lobby partner is an engagement strategy that uses your platform as a premiere performing arts venue as a valuable resource for your community. Social media can play a key role in effectively implementing this partnership model. Begin by using both offline and online listening/networking skills to find and invite local non-profits to be a partner for each performance in your season. Invite this partner to have a table in the lobby for sharing information about their cause, provide them with a set of donated tickets to the performances, and help tell their story on social media leading up to the performance. They in turn will spread the word about the performance to their own network, building good will, visibility, and generating additional ticket sales to the performances. You can feature a different non-profit for each touring production, or invite multiple partners to get involved in a single event. Listen to your network and search for partner non-profits (see Strategy 4) who fit thematic elements of a show, who advocate for a cause supported by the touring artists, or seek out local groups that have a similar target audience demographic (e.g. children and families, women, etc.). 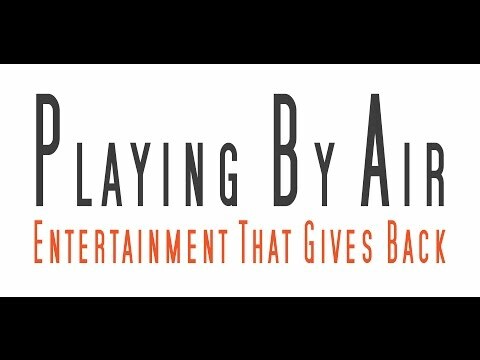 For example, the touring cast of Playing By Air donates shows and workshops throughout the year to children's hospitals and cancer support groups. This mission helped bring over 20 local cancer support organizations to their production at the Nashville Children's Theatre. 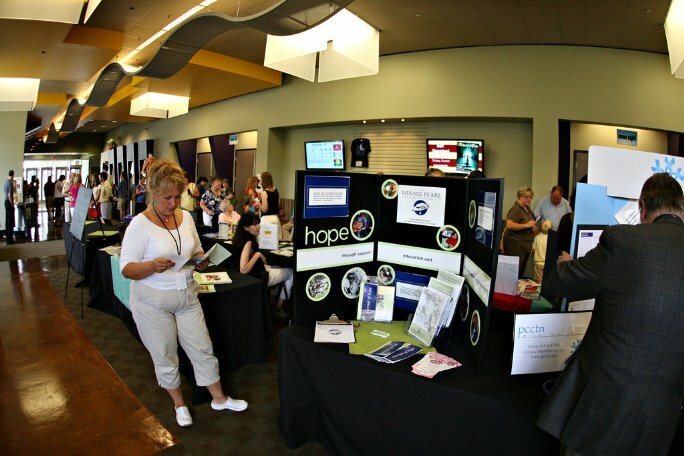 The organizations were invited to share information in the venue lobby as well as attend the show. In addition to the full houses, the event was a powerful opportunity for the local cancer community to come together, generating positive visibility and new partner opportunities for the host venue. An audience member visits a booth at a cancer support program in the lobby at Playing By Air's show. This tool offers multiple tabs and columns to organize your Twitter keyword listening, adding people to lists, and participating in multiple online conversations. Along with Hoot Suite, use this tool to explore the Twitterverse by listening for specific keyword and geographic searches with real-time updates. Search Twitter profiles and bios for keywords and sort by followers to find influencers. Learn how to setup lists to organize your Facebook contacts. Easily create content that combines text, graphics, and photos to make compelling content to share online. Stay on top of your YouTube video channel views, comments, and engagement from your mobile device. 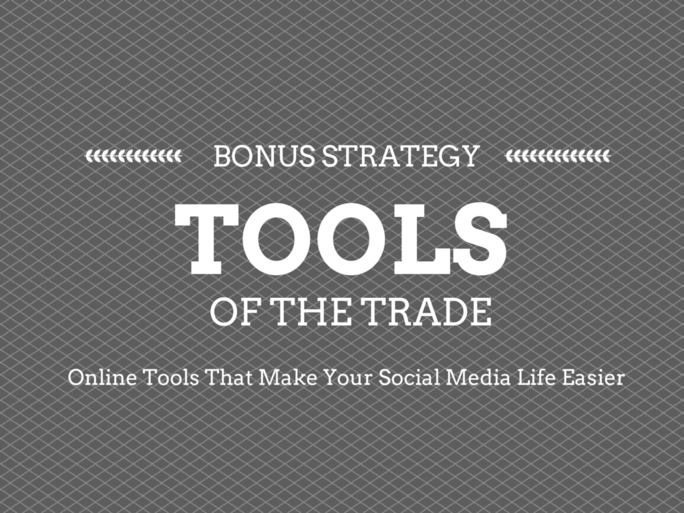 * These are tools that we use in our own social media strategies, and we have no ties to these companies. 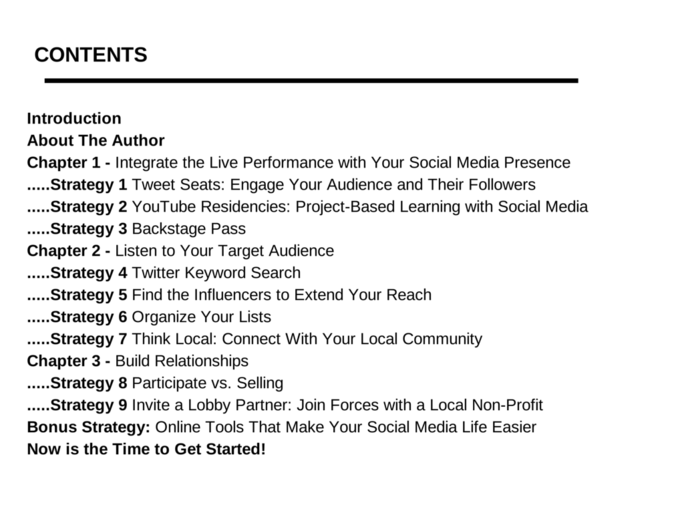 Are you excited to implement these social media and community engagement strategies customized for your own organization, mission, and local community ecology? My team and I would love to continue this conversation to discuss how we can best support your efforts. Our team of experts is available for both formal and informal consulting, professional development workshops, as well as opportunities to pilot innovative engagement programs with the touring artists of Playing By Air. Connect with us on Twitter at @DoGoodandJuggle and @PlayingByAir to share your own ideas, questions, and experiences. We’d love to hear from you! Captivate Your Audience With a Joyful Fusion of Music, Circus, and Theater!